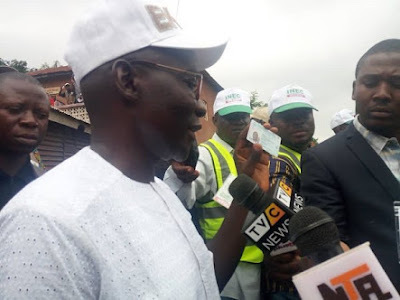 The Peoples Democratic Party's candidate in last Saturday governorship election in Ekiti State, Prof. Olusola has insisted that he won about 70% of the valid votes cased at the various polling units. He said based on results from the various Voting centers, there was no way APC's Kayode Fayemi should be the winner. Also, the national leadership of the Peoples Democratic Party (PDP) has rejected the results of last Saturday’s governorship election in Ekiti State. The election was won by Dr. Kayode Fayemi of the All Progressives Congress (APC) who defeated the PDP candidate, Prof Kolapo Olusola and other candidates. But the PDP, at a media briefing in Abuja yesterday, said the election results were falsified by the Independent National Electoral Commission (INEC) in favour of the APC. The party described APC’s victory at the poll as “daylight robbery, brazen subversion of the will of the people and direct assault on our democracy”. PDP spokesman Kola Ologbondiyan said the “authentic results” from the polling centres indicated that the PDP candidate won the election. Ologbondiyan said: “It is clear that the PDP candidate, Prof. Kolapo Olusola-Eleka, incontrovertibly won the election, with very comfortable margin over the APC candidate, only for INEC to allow the alteration of results at the collation centres. “Painfully, the people of Ekiti State were pillaged, openly brutalised, confronted with the worst form of cruelty and intimidation from security agencies, and their mandate, which they freely gave to the PDP, was snatched at ‘gun point’ by enemies of democracy, who are parading themselves as icons of anti-corruption. “Nigerians are witnesses to all manipulations by the APC, aided by security agencies and compromised INEC officials, to rig the election, particularly, the audacious alteration and substitution of election results in favour of the APC at the collation centers amidst the brutalization of our agents. “The PDP has the details of all the polling units where we won, mostly with very wide margin ahead of the APC, only for the security agencies to chase away our agents, then aid the alteration and swapping of such results with those smuggled in by the APC at the collation centers. “We have the detail of the discrepancies between the authentic results from the polling units and the false figures eventually announced by INEC. “It is also instructive to state that all the issues we raised ahead of the election, including the conspiracy between the APC, some compromised INEC officials and security agencies; the importation of thugs from other states by the APC; the use of brute force against our members, the falsification and alteration of results in favour of the APC, all manifested in the election. “We know how APC conspired with INEC to bring in card reader machines belonging to Kogi, Lagos, Ondo, Oyo, Ogun states into Ekiti state to enable APC members from these states to vote in Ekiti election with ease. “Nigerians will recall the irresponsible and inciting statement credited to the factional National Chairman of the APC, Adams Oshiomhole, where he threatened that the opposition will be ‘crushed’ in this election. “The APC governorship candidate, Dr Kayode Fayemi, also vowed that they will “cage” the Ekiti State governor, Chief Ayodele Fayose. “These threats were carried out with the full collaboration of our security agencies”. The PDP said that it had details of how APC governors and ministers diverted huge sums of money from their states and ministries to bribe top officials of INEC, particularly, those in the ICT Department, as well as security agencies to perfect the brigandage against the people of Ekiti state.